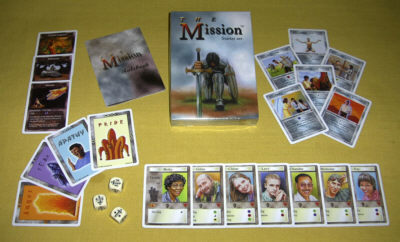 The illustrations contained in the pages below were produced for 'The Mission' Christian fantasy collectable card game that was released in the USA and UK. Click on any on the portfolio pages below to view the artwork. There are up to 24 images on each page. The main card images were oil on canvas paper A5 size and the larger 'Mission' image was a 30 x 36 inches oil on canvas painting. The main figures on the belt were myself and artist Julian Mason. We had to set a trapeze up to swing from for the photo session which had a few interesting glances from our neighbours! Any of the images may be licensed for editorial use and I am available for commission for book, computer game or CD illustrations. Contact me for information on commissioning me or using the illustrations via the e-mail below.